In case you still don’t know, I LOVE avocado. The worldwide avocado obsession possibly started with the ridiculously endless yet highly addictive avocado toast pictures that flooded Instagram in recent years. But let’s not get too cynical about its fame and take the time to acknowledge the fact that avo is amazing (and nutritious, creamy, delicious, cute, natural). As for the recipe, a friend of mine tried this brownie and she said it was a total bomb. Well, it is indeed. You might be worried about the end result when there’s no butter or any liquid oil added to the recipe; relax. 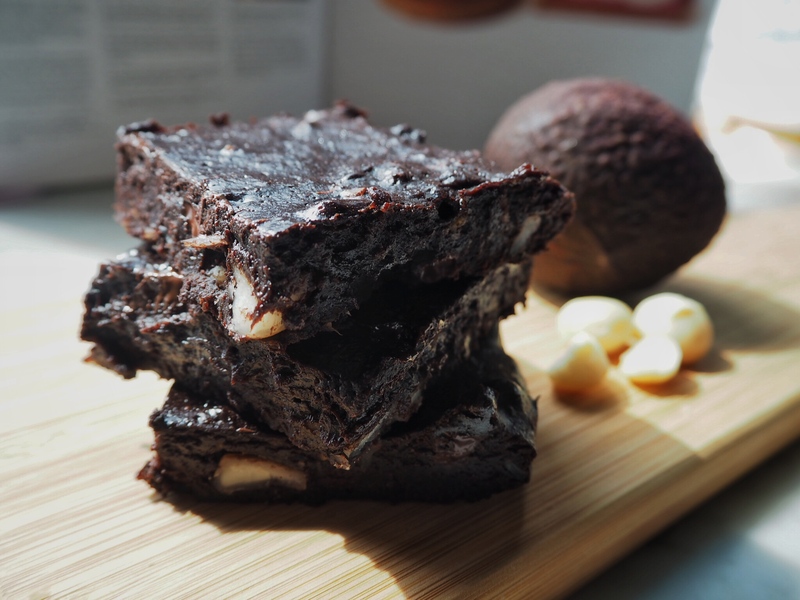 The smoothness of macadamia nut butter blended with the creaminess of avocado keeps the final treat moist and gooey – just as how brownies should be. I also wanted this brownie to feel a little bit more “mature”, so I used coffee and good quality dark chocolate to provide a contrast to the sweetness of the white sugar. In the end, there’re so many different textures in every last little mouthful – creaminess from macadamia nut butter and avocado; crunchiness from chopped macadamia; and gooeyness thanks to half-melted dark chocolate. So, even IFFFF you don’t have the biggest sweet tooth, you’re gonna declare this brownie your new bae. Preheat oven to 350F (175C). Line a square pan with parchment paper. In a bowl, sift in and combine well flour, cocoa powder, and salt. In another bowl, mash the avocado until smooth with a fork or masher. Add macadamia nut butter, sugar, eggs, vanilla, coffee mixture, almond milk. Mix well. Pour the dry flour mixture into the wet ingredients in three batches. Stir the batter gently with a spatula until everything is just incorporated. Stir in the chopped dark chocolate and macadamia. Pour the batter into the prepared square tin. Bake the brownie for 18 minutes (don’t overcook brownies!). Take the brownie out from the oven and let cool in the pan for at least 10 minutes before any handling. Macadamia nut butter is very easy to make as long as you have a blender or preferably food processor. Roast 200g raw macadamia in an oven at 350F (175C) for 8 mins. Blend or process the roasted macadamia until completely smooth and creamy. Store the excess in an airtight jar and put in the fridge.